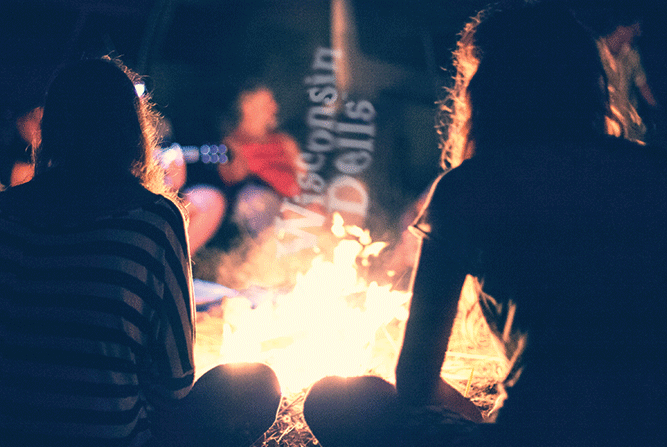 Campgrounds in and Around the Dells for the Summer! This blog post was published on May 11, 2016 and may contain outdated information. Imagine toasting a marshmallow to a crisp golden-brown and then pressing it between two flakey graham crackers and a slice of creamy chocolate. As you’re enjoying your s’mores, gaze up at the moon and take a breath of the fresh Wisconsin air! There’s nothing quite like a nice summer camping trip with your family. Whether you’re up for an adventure during the day or want to relax at the campsite with the kids, you’ll find a campground that caters to anyone and everyone in Wisconsin Dells! From peaceful, primitive camping in the surrounding State Parks, to full luxury cabins with all of the amenities of home, you’ll find thousands of beautiful campsites in Wisconsin Dells, most located just minutes from Wisconsin Dells attractions and Waterparks! If you want the most bang for your buck, some campgrounds include affordable vacation packages so that you can experience a few Wisconsin Dells attractions and waterparks for very little cost. Be sure to take advantage of these, as they are a discounted way to have fun in Wisconsin Dells. 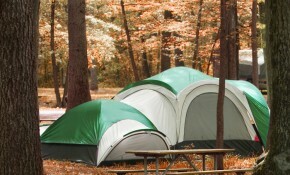 Dells Timberland Camping Resort is one campground that offers ticket packages on area attractions for a great price! When you stay at Mt. Olympus Camp Resort Villages, each guest receives free access to Mt. Olympus Water Park & Theme Park! Staying at a campground close to a beach is a great way to take advantage of water activities and relax in the sun. Whether pontooning, tubing, fishing, or roasting s’mores around the campfire, the beach is a quiet setting for some family fun! Holiday Shores Campground offers ski boat and pleasure boat rentals right on the Wisconsin River. If fishing is what you’re after, Stand Rock Campground has an on-site lake for catch-and-release fishing, as well as kayaking and swimming! On those hot summer days, a swimming pool could be the difference between life and death! Most campsites offer pools to cool off in or for the kids to play a friendly game of “Marco Polo” while you’re poolside sipping a tropical drink. Please check with each campsite to ensure the availability of a pool. Sherwood Forest Campground offers a splash pad, on-site pool, and other water fun! At Yogi Bear’s Jellystone Park, kids can enjoy their water playground with 25 interactive water activities and four waterslides, designed for kids ages 3-12. KOA, Bonanza, and Wanna Bee Campgrounds are all just minutes from your favorite Wisconsin Dells attraction and offer their own family-friendly fun. Enjoy relaxing by the pool or taking a hot shower. 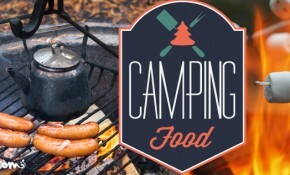 Many other activities and amenities are offered at all 3 campgrounds! Just a hop, skip, and a jump from Wisconsin Dells you’ll find Al’s Fox Hill Campground and Dell Boo Family Campground. Both campgrounds offer clean campsites, electric and water hookups, and a swimming pool! You’ll also find clean bathrooms and showers at both campgrounds! If you’re like me and need a wifi connection to survive, most campgrounds now offer wifi so that you can surf the internet right from your campsite! This gives you access to look up the recipe for hobo stew or search for a scary story to tell in the moonlight! Check with each campground for availability. For the adults, at Edge O’ Dells Camping & RV Resort, guests ages 21+ can enjoy live music on Saturdays, a sand volleyball court, an on-site convenience store, and the delicious Edge O’ Dells Bar & Grill. Shuttle service is available to all of the nearby Wisconsin Dells attractions! With updated shower facilities as well as clean cabins, park models, & seasonal sites, you’ll be able to escape at Edge O’ Dells.